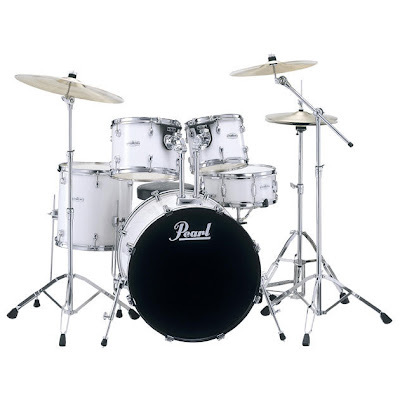 A Complete PackageThe Forum Drumset package includes absolutely everything you will need to get started on your path drumming satisfaction, including a set of high-quality cymbals, a pair of 5A sticks and a sturdy drum throne. New FeaturesForum Series drumsets offer many upgraded features. Pearl's patented Integrated Suspension System Tom Mounts, already featured on Pearl's Vision Series, now come standard on Forum. The I.S.S. Mounts attach to the hoop of the toms without contacting the shell, maximizing resonance and minimizing time spent changing drumheads. Improved cymbals provide a much higher quality sound, new low-mass lugs increase resonance, and two of four finishes (Jet Black & Red Wine) that feature black drum hardware, making them the only standard black drum hardware kits in their class.